File Label Express welcomes Spirit Group! We believe that the companies that comprise the Spirit Group are a powerful retail marketing bloc. 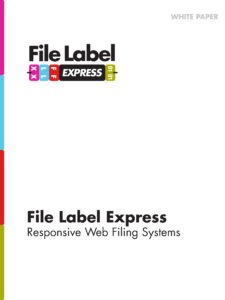 File Label Express is the most advanced file and records labeling software on the market. Our product is designed to replace legacy systems that rely on old technology while providing a straight line to upgrading your revenue, by offering your customers more management of their records data. Our program, offered exclusively to Spirit Group, provides a no cost upgrade for your existing clients. We can match your customer’s label designs and we can increase your bottom line with aggressive net pricing to your companies. So, flip the labels to File Label Express at no cost to you, simply buy the stock for the customer to use AFTER they run out of existing label stock. Buy on the front end or we’ll hold that purchase for 90 days. We value your participation and we want to do business with you. No tiers, no minimums, reduce label costs by at least 40% by just doing it. Download either White Paper to explore our offering, or simply click the Contact Us button and let us know you’re ready to get a start with increasing your profits through label sales, and having protected territories honored. SaaS and E-commerce, in general, sacrifice margin for volume and operate nationally. We’re marketing nationally, our individual sites can market locally. The E-commerce site will compete with Big Box and Amazon in the one place they can’t really compete with us, which is we are competitive AND you can call us and ask questions AND get professional one on one consultations. We save the customer money and provide value through a great experience, great software and way to grow with us.